Climb the Colle delle Finestre! Suffering like us from Giro withdrawal symptoms? We have a cure – if climbing more than 20km at a gradient average of nearly 10% can be called a cure! The inaugural Gran Fondo La Marmotte – Sestriere in the magnificent region of Vialattea will take place on Sunday 2nd August, allowing riders to test their endurance on the Colle delle Finestre, that infamous climb from the penultimate stage of this year’s Corsa Rosa. Gran Fondo Giro d’Italia events feature closed roads, mass starts, exciting routes, professional support on the road (course marking, technical support, well stocked aid stations, etc. ), equipped and entertaining finish areas, and a two-day Expo with a traditionally joyful Italian atmosphere. The whole experience enables participants to challenge themselves and celebrate their accomplishments, while enjoying “La Dolce Vita”! Each Gran Fondo Giro d’Italia has a timed section and, when there are climbs such as this one, there’s a Gran Premio della Montagna (GPM) and prizes are awarded in a number of other categories. 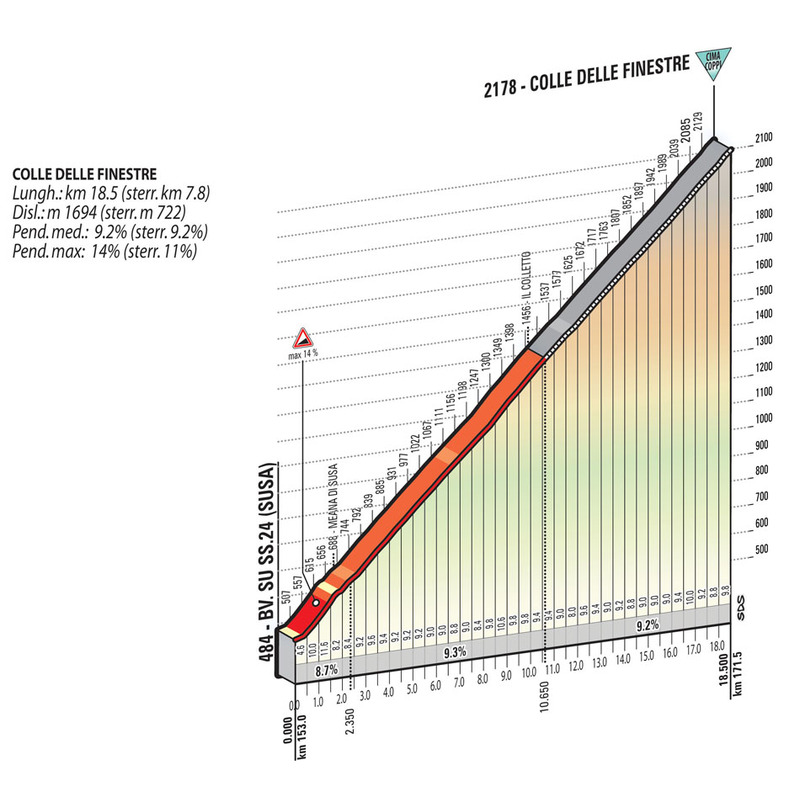 The profile of the Finestre climb doesn’t do it justice – remember the gravel? So to give you an idea of what’s in store, here’s GCN’s helpful guide, from the 14% ramps at the start to the 8km section of gravel near the top of the climb. There are two Gran Fondo routes: the Dormouse at 85km and, for the more ambitious riders, La Marmotte at 110km. If you fancy giving it a go, register here sooner rather than later! And if you do tackle this route, let us know how you got on! Previous PostGiro Tweets: Arrivederci Italia, mille grazie! This like one for me, but very, very slowly!! 10% for 12 miles! Good God, I like climbing but that’s nuts!